The awareness and knowledge of health insurance among the practitioners of the Nigerian entertainment industry has become imperative. Due to the absence of it, the industry has lost several of its well loved musicians and actors to dreadful sicknesses like renal failure, fatal accidents and other vices while trying to raise funds. This has however necessitated the need for a well structured health insurance policy and cover for the entertainment industry. 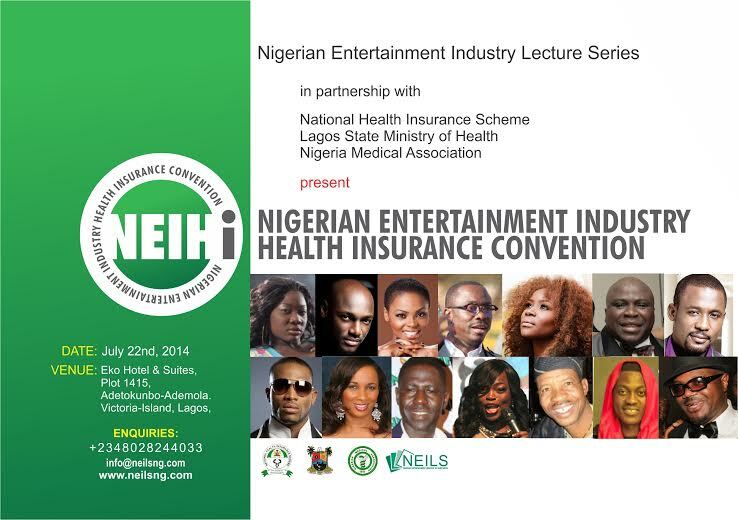 The Nigerian Entertainment Industry Health Insurance Convention is designed as a customized learning and education platform for the practitioners of the entertainment industry and invariably members of the public at large to understand the importance of health insurance and at the same time embrace it. The convention seeks to create special insurance covers and policies for the practioners of the entertainment industry. Also, to illuminate complex issues of health care practice and policy by bringing together leading-edge doers and thinkers – from operations to academia, from clinical practice to corporate management. The convention delineates perspectives of stakeholders throughout the healthcare community in addressing broad issues and the type of health insurance to go for. The convention is presented by Nigerian Entertainment Industry Lecture Series (NEILS) and is in partnership with National Health Insurance Scheme (NHIS), Lagos State Ministry of Health and Nigeria Medical Association. It is billed to hold on July 22nd, 2014 at the Grand Ball Room of Eko Hotel & Suites in Lagos.